Valor utilizes the most advanced technologies in our product manufacturing. To ensure we maintain product quality and accuracy, Valor utilizes the most advanced production technologies including; CNC Routers, CNC cut to length lines, dedicated fixturing and clamping systems, welding, and bonding stations. Our objective is to efficiently produce excellent products on a continuous basis. 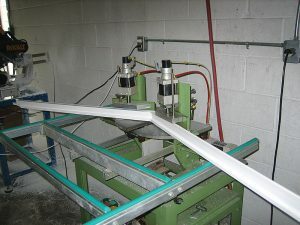 As a large producer of custom PVC Millwork, we stock a wide range of PVC Sheets, Trim boards, milled and extruded profiles. Our broad range of inventory allows us to supply large quantities or kit exact custom cut requirements. Valor can process and supply your standard or custom order to best suit your specific needs. Our Custom Trim Shop can cut, mill, bend, and assemble a myriad of trim elements and deliver them in a linear, kitted, KD or fully assembled format. The addition of our line of extruded Cellular PVC Mouldings further expands on the endless architectural design possibilities. Our Column program includes Square Columns; as well as our Rigid PVC Round Column which is available in 6”, 8”, 10”, and 12” diameters, in lengths up to 12 ft. and includes a beautiful Tuscan Style Cap and Base Kit. We offer an optional engineered internal support for all columns where a load bearing requirement exists. Our advanced systems employ custom designed and built pneumatic clamp and cutting stations for extreme cutting accuracy where required. Contact us today to explore the endless solutions Valor can provide. 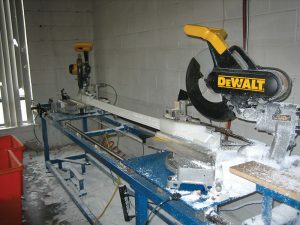 Valor is Canada’s leading manufacturer and supplier of unique and high quality residential remodeling products. All of our unique products are the highest quality in their fields, and are supported with the most aggressive warranties available. Designed by Imaginus North Inc.